COMPACT SIZE FOR PORTABILITY - Inflate easily with a convenient, space-saving air pump. 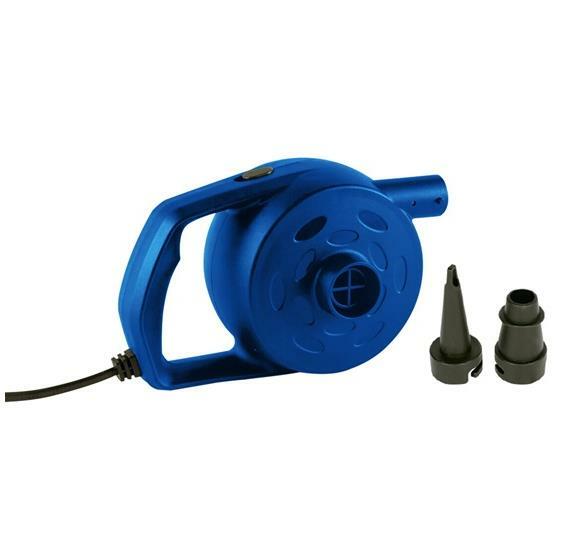 This compact, high-flow air pump measures 7.2-in x 4.9-in x 4.9-in..
DC CONNECTION FOR CAR USE - This air pump that uses your car’s charger socket, making it easy to I=inflate on the go. Plug the pump into any standard 12-volt car outlet. AIR HOSE INCLUDED - Effortlessly inflate your pool tubes and floats. This product comes with a convenient air hose, so there’s no need to hold the pump as you inflate. MULTIPLE NOZZLES - Use the same pump for various types of inflatables and tubes. This pump includes nozzles for standard inflatable valves and large Boston valves. Never be caught without a way to float your inflatables! The RhinoMaster® Cyclone High-Flow DC Air Pump pumps your inflatables with DC current, making it compatible with your car's DC outlet. Inflate your floats and towables no matter where you are - your local pool, the beach, or even simply in your own driveway! Inflate with ease with the included air hose; no need to hold the pump as you inflate your favorite raft or towable! This high-quality pump inflates with higher pressure than standard air pumps - meaning less time to pump and more time to play. Plus, because the pump fits both Boston and standard nozzles, it's your perfect go-to pump for inflating your floats on the go! So get out there and play - you'll always be ready for fun on the water with RhinoMaster®!